Did you watch the red-hot blockbuster named Gravity? If you did, you must be achingly impressed about its novel originality, ideal plots designs and earthshaking 3D special effects. Besides, you may still drench yourself in its lovely song called Parachute, which fuses perfectly with images. You may be fascinated by this beautiful song and buy this movie from iTunes in MOV file format. All you want is to play this song on your music devices on the go. Yet, you should first understand that you cannot achieve your desire without a helpful music extractor to convert it from MOV to MP3 on Mac. Far-famed MOV video transcoder 3 to convert MOV to MP3 audio format on Mac as iPhone Ringtone or playback on iPhone iPad iTunes with best audio quality. With a truckload of video converters flooding over the current market, you may be at a loss to choose the suitable one. Instead of searching a tool without any clue, it's advisable to consider an unmatchable software - MacX Video Converter Pro to convert MOV to MP3 on Mac. How Much Do You Know about MacX? 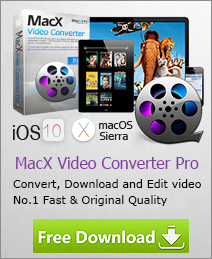 MacX Video Converter Pro is an ideal and professional video converter endowing you to convert MOV to MP3 on Mac , as well as extract audio from MP4, MKV, AVI, VOB to MP3 effortlessly. Plus, it can deliver a killer fast speed attributing to its built-in hyper-threading, multi-core (up to 8) CPU and GPU HW acceleration techs. Thus, you can transfer MOV to MP3 on Mac fast. Better still, it can rip MP3 audio without compromising quality thanks to its inherent De-interlacing and High Quality Engine. Hence, the output MP3 quality is indistinguishable from the original. No matter you are a newbie or veteran, the straightforward interface will grant you to dive right into this program and start using it within minutes. 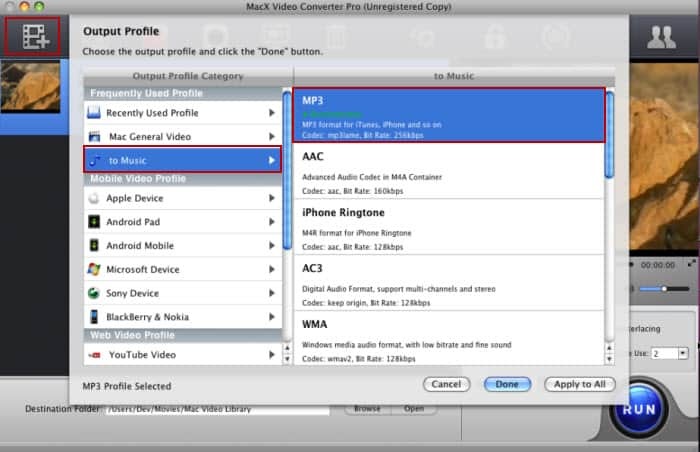 The following step-by-step tutorial will walk you through the converting MOV to MP3 on Mac process. Step 1: Free download this MP3 music extractor on Mac and launch it. Then click "Add Videos" to import MOV file. Step 2: Choose Output format as MP3 from "to Music" in the pop-up window. Step 3: Select an output folder to store your output file and then click "RUN" button to begin ripping MP3 music from MOV video files. Besides the features mentioned above, MacX also dabbles in other aspects. 1, It also enables to faultlessly convert any videos among HD videos and SD videos, including transferring MKV to MP4 , MOV to MP4, MTS to AVI, MOV to WMV, YouTube to MP3, FLV to 3GP, etc. for putting to iPhone Xs/X/8/7/Plus, iPad Pro, iPad Air 2/mini 4, Samsung Galaxy S9 edge/Note 8, HTC 10, Surface Pro 4, PSP, etc. without any hassle. 2, It can also act as a stunning photo slideshow maker to let your picture collections become a vivid video. 3, More incredibly, it can empower you the freedom to record on-screen actions and record interesting videos with internal camera as you like.